Then, in third position down the Dock is Wmbutton. # The above don't need to be in any particular order. Self explanatory. 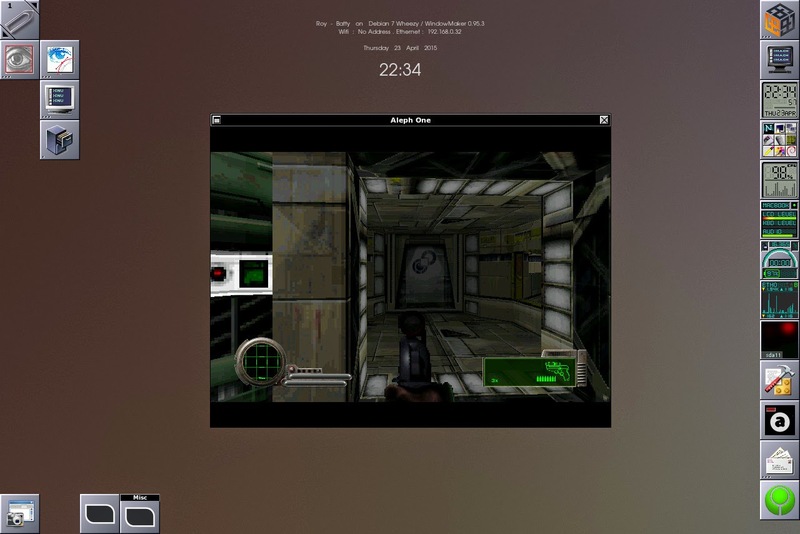 it shows 1 , 11 and 21 triggers the first button, 1 opens Iceweasel from left mouse click, 11 opens an Xterm terminal with the text web browser Links2 from middle click and 21 opens Midori browser from right click. 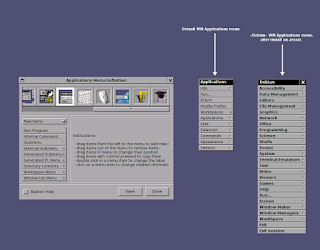 Means that a right click on the very last button will open a Xterm window of 120x35 pixels size ("-geometry" option), font color should be black ("-fg black") , window background be a 70% grey ("-bg grey70"), window title should be "WMButton Config Editor" ("-T ''WMButton Config Editor " option), and the default system text editor, that is Nano, should open file .wmbutton situated in my home folder ( "-e editor ~/.wmbutton &"). So basically , anything that can be launched from the command line (well , that's everything in linux, if you know the command…) can be launched by Wmbutton. There is also the possibility to change the small icons on the buttons, but I did not investigated that just yet. Number four in the Dock is Wmclockmon. It's a beautiful digital clock, that can be used as alarm too. "Backlight" can be turned on and off, colors can be changed. 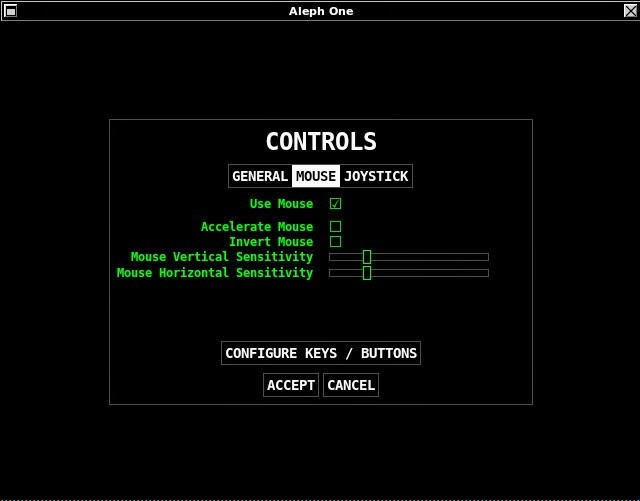 These options are available through the combination of Left/Middle/Right mouse button and Ctrl key. By default it shows an LCD look. 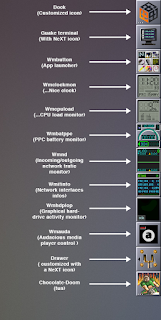 Number Five is Wmcpuload, to display your … cpu load. Then in sixth position is Wmbatppc, it will nicely display your Powerbook battery charge, if it's plugged to power or not , time left on battery… ect. 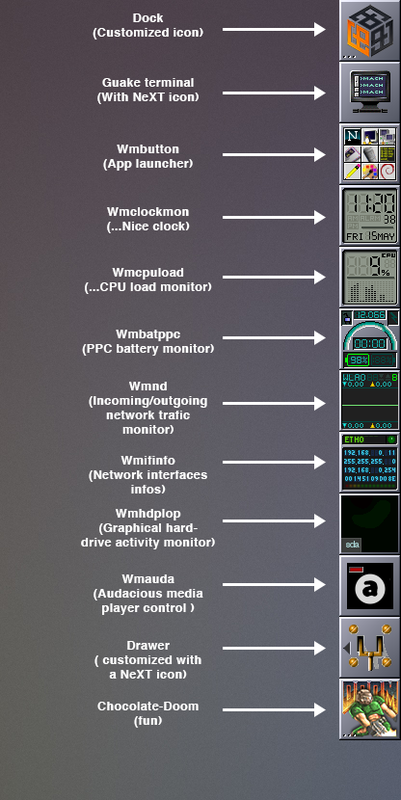 Seventh is Wmnd (that is for "Window Maker Network Device"), to display in and out network traffic/activity. Left click on the interface name will cycle through the interfaces available, left click on the graph cycle through the graphic modes. In eight , we have another network monitoring app, that is Wmifinfo. Will display your network interface ip address , router, MAC address. 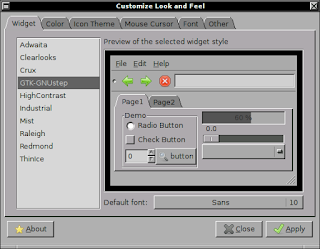 Click on the interface name cycle through the interfaces available. gets very colorful when you copy/write/read files from your HD, SWAP activity is shown too (in green color…). Doing something… Can get much more colorful though. Appart from being funny , it can be useful to watch is a process is finished or not. Tenth is Wmauda , which is a dock app control for Audacious music player. Wmauda dockapp, idle and running. Not too much to say on that one, just a Audacious front end to control music volume, play, pause…ect. Next is the drawer . 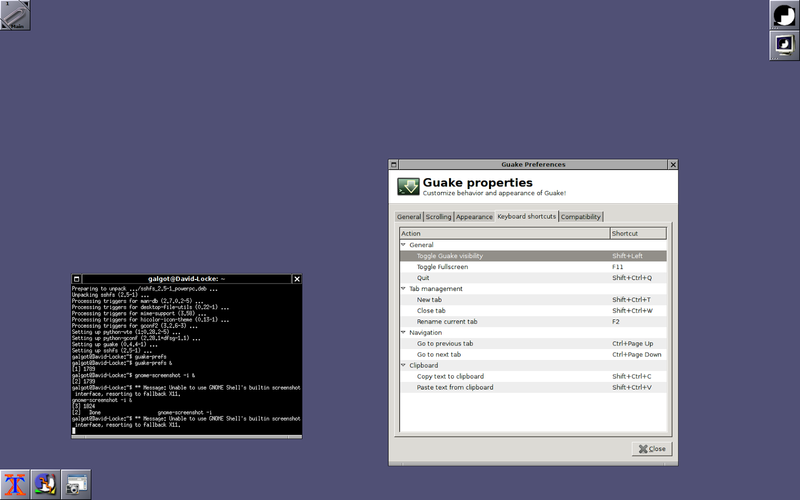 Now that we have Windowmaker 0.95.5 with Jessie, we have that integrated. Just a right-click on the dock, and "Add a drawer" (1). A new "tile" with default app icon will appear, that's your new drawer. To add an app to it , drag an App "tile" to the drawer (2). You also have access to options by right-click on it and go to "Drawer options". 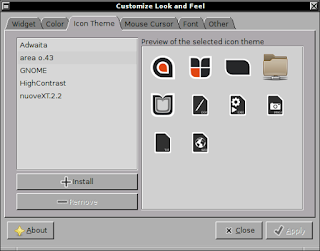 With a nice penguin icon, drawer opening up, and a set of 10 icons. Question marks correspond to apps you don't have installed but that are setup to launch by wmdrawer in the configuration file called ".wmdrawerrc" located in your home directory. All setup , side on which the drawer opens, numbers of apps, ect… is done through that file. Nothing too difficult. Everything is explained. You maybe first want to change the direction to which the drawer opens by setting "direction" to 1. Set the "btns size" to 64 to have the same buttons size as the docks "tiles". You can add your images path for icons to put on buttons after "[images_paths]". Then add the apps you want to be shown after "[column]". 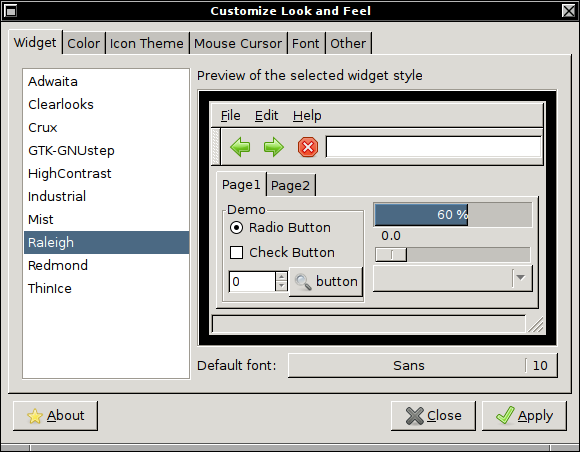 for example for leafpad text editor , add a line with (Leafpad) , that will be the name of the app displayed when you mouse over the button, then (leafpad.png), that is the icon to be displayed for Leafpad found in the image path you've specified earlier, and then (leafpad), that is the command to launch the app. It's specific for Apple laptops, and displays your screen luminosity level, sound volume level and should also display the keyboard luminosity level , but I've never managed to make work that last. Anyway, it's broken in Jessie, even though I have Pommed installed , and Pbbuttonsd ( that is another PowerBook/iBook special keys deamon) uninstalled to avoid conflict… It launches , but displays nothing. 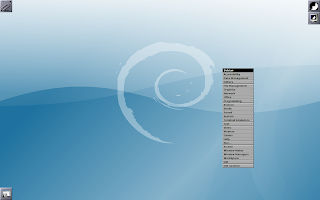 With that one in hand , time to try a clean Debian 8 install, with a WindowMaker/GNUstep configuration. 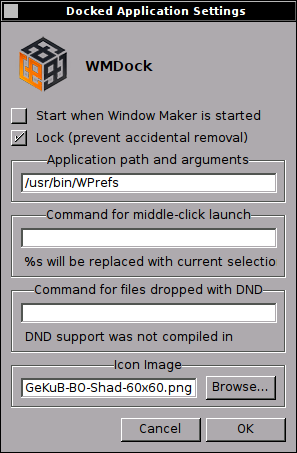 Why WindowMaker ? Because I like it. 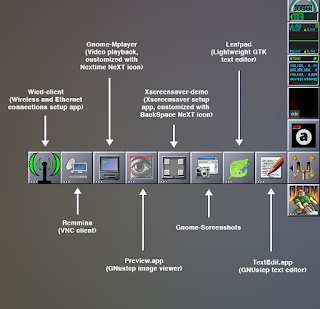 It looks like NeXTstep/OPENSTEP, it's part of my retro-ish Macintosh-Apple-NexT obsession. 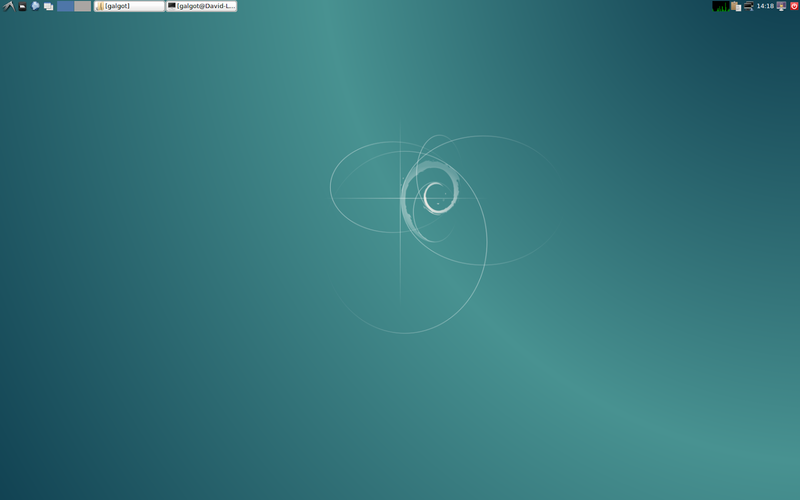 Also it's light, very usable , and can make a beautiful desktop when nicely configured (well, to my taste, that is…). Installing a new system is an occasion to see if the configuration that I like works . I followed the PPC Luddite installation guide, recently updated for Jessie. It's very well done. 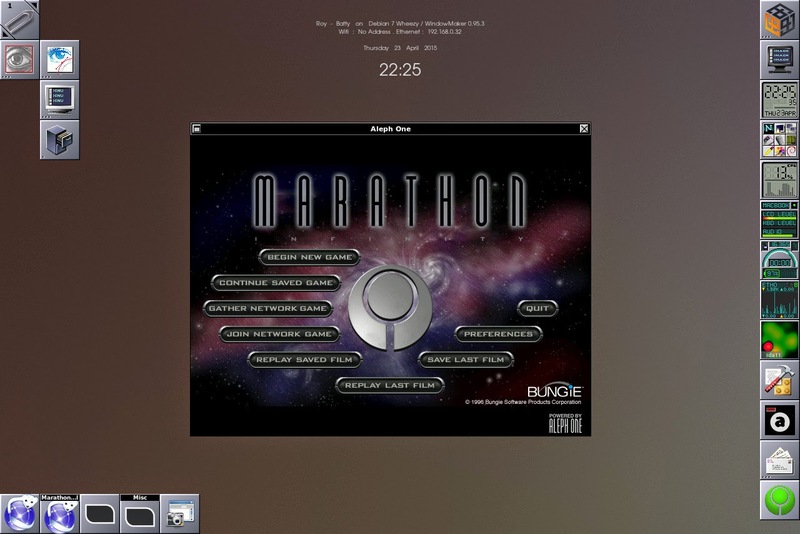 I'll only add here things specific for this PowerBook 17" and different things i've installed. I checked Lxde install during the process, I like to have it as a fall back wm, it comes with a decent set of apps, like Pcmanfm and other standards that are good to have . Also the machine has a decent speed (1.67Ghz) and a 80Gb partition for Debian, so I don't have to worry too much about cluttering the system. Than will open sudoers file in nano text editor. 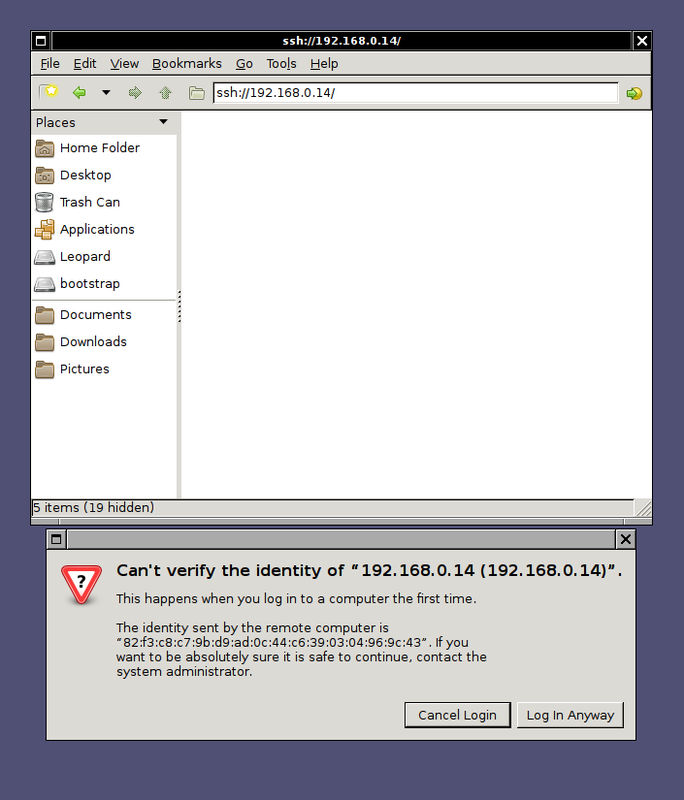 User being your login name. then ctrl-o to save (as sudoers, erase .temp before saving…) , and crl-x to quit nano. Voilà, you are the real master. Then, as this Powerbook has a French azerty keyboard , I had selected French keyboard during installation. This gave a French keyboard, but not a French PowerBook keyboard, so had to be careful when choosing passwords for root and users. some keys are misplaced. for example if you want a - sign , you have to press § key… letters and numbers (these works with the shift key on azerty keyboards) are fine. But we have to put all that in order for the other keys. it will ask your password and open the keyboard config file in nano. then ctrl-o to save and ctrl-x to quit. 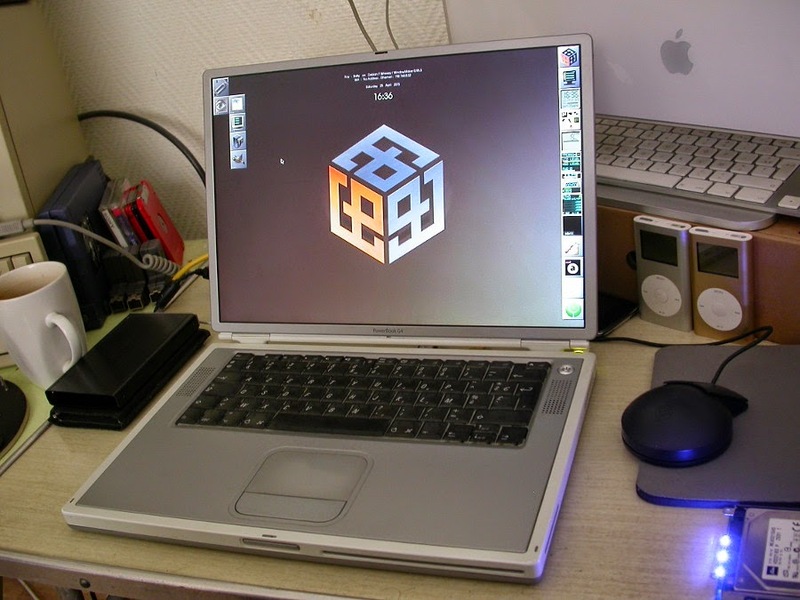 After reboot you should have a French powerBook keyboard. Well , there's a caveat for aluminum PowerBooks like that one , the @ and < keys are swapped… it's the only thing I've found. Funnily , with that config, on older PowerBook models like the Pismo or Wallstreet, the all keyboard works ok, with @ and < in their right places… So there is maybe a specific config change to make for French Al PowerBook keyboards, but I don't know it. Next, time to see into that KMS thing. As I said , it booted without problem to lxde after install, I noticed that dragging Pcmanfm windows was a bit slow though. 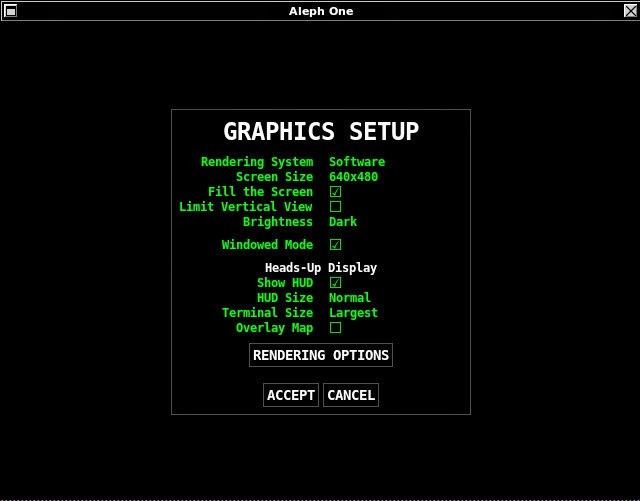 append="quiet splash radeon.modeset=1 video=radeonfb:off video=offb:off video=1680x1050-32 radeon.agpmode=-1"
to apply the change at boot. [ 104.057] (II) LoadModule: "radeon"
[ 104.112] (II) Module radeon: vendor="X.Org Foundation"
[ 104.235] (II) [KMS] Kernel modesetting enabled. [ 104.275] (II) Loading sub module "dri2"
[ 104.275] (II) LoadModule: "dri2"
So maybe I'll try using Wheezy kernel back to solve the problem. But that latter. 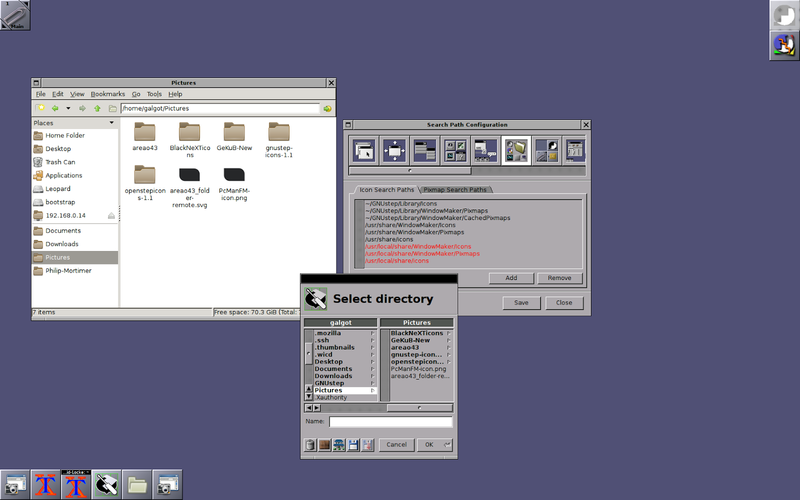 Then after logout and choosing WindowMaker in the login manager instead of Lxde in the upper right menu, we have the default WindowMaker desktop. will get it for you. Will open the gui for you. To have that terminal always available from an hot-key. And there , uncheck "Enable popup notifications on startup". In the keyboard shortcut tab , you can customize your activation hot-key, I usually use Shift-left. 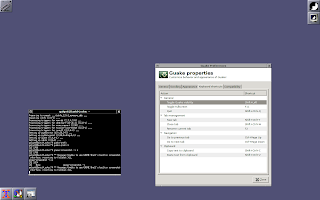 Now to have Guake launched at start-up, You can add "guake &" (without quotes) in the Autostart file found in --> yourUserFolder/GNUstep/Library/WindowMaker folder. 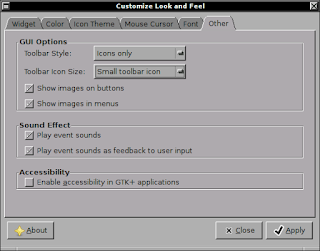 Or you can just replace the ugly xterm icon that is under GNUstep dock icon on the desktop with a Guake icon that will launch at start-up. To do that, right-click the xterm icon and go to "Settings", then uncheck "Start when WindowMaker is started" and "Lock (prevent accidental removal)", now you drag that xterm icon on the desktop to remove it (close any xterm windows before). 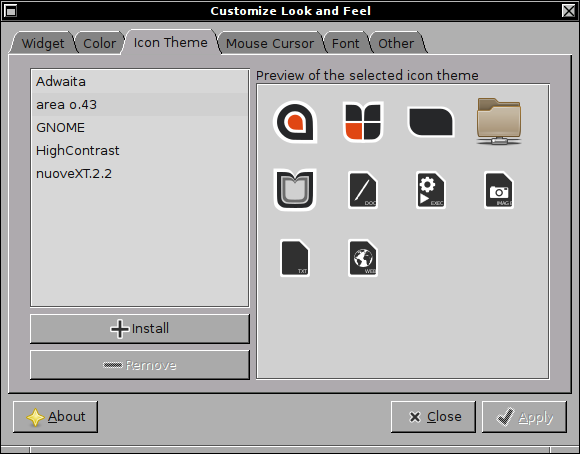 Then , if Guake is not running, launch it, and drag the icon from the lower left to the upper right corner under the dock icon. Right-click on it, go to "Settings" and check "Start when WindowMaker is started" and "Lock (prevent…". 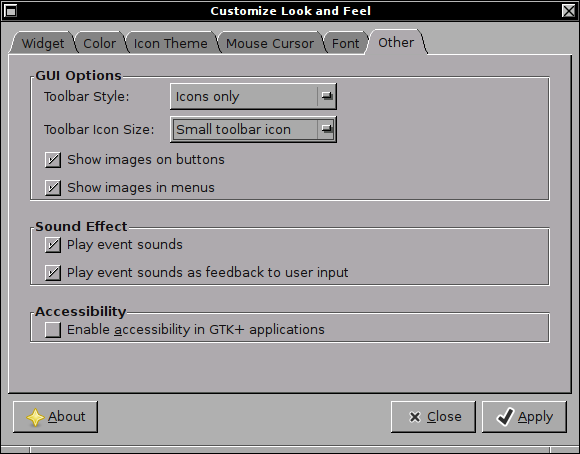 Note, after system startup, Guake icon will be greyed until you trigger it with the hotkey you've chosen to show the terminal in the Guake preferences. 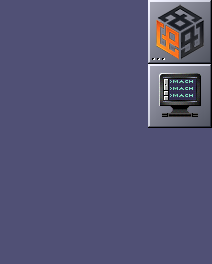 Ok, but now Guake still has that ugly WindowMaker default app icon… need to change that. Ok , now how to use these ? 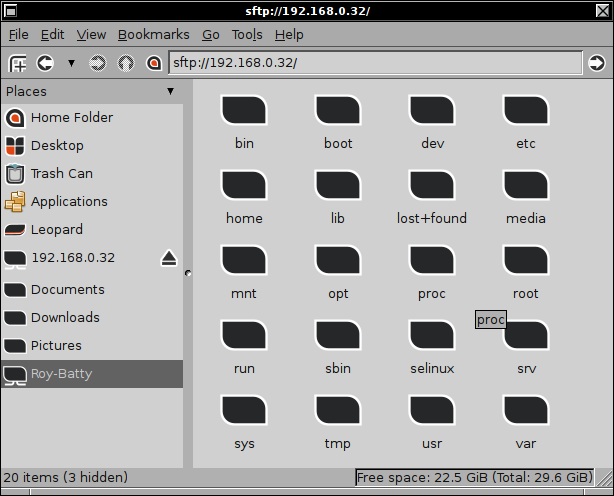 Download , extract, and using Pcmanfm file manager (or something else, but that one it's been installed with Lxde) place them in a conveniently named "Pictures" (or "Images", or "Icons", or "MasterPieces") folder in your home folder. 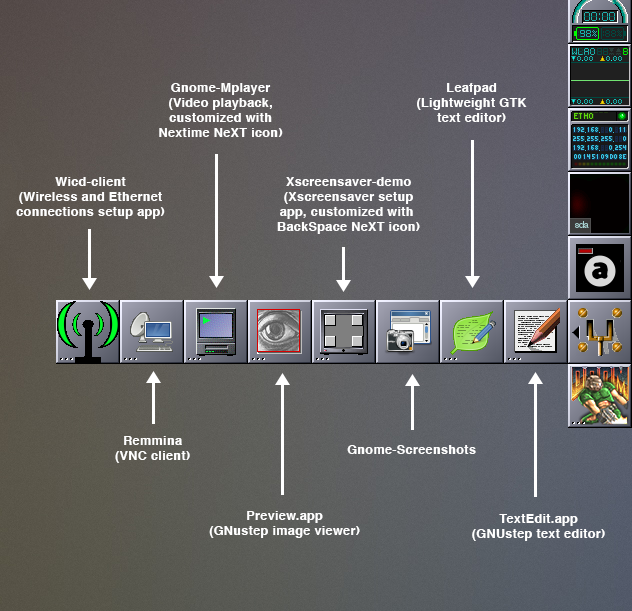 Then we have to set the path to these icons in the WindowMaker preferences. 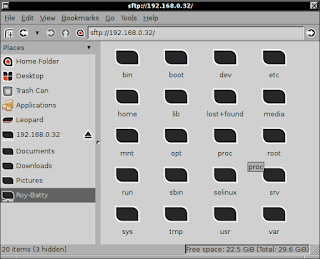 Open these preferences by double-clicking on the dock icon, and go to "Search Path Configuration", in there click the Add button, and for each icons folder , select the directory containing the icons. 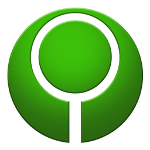 For example , for the downloaded openstepicons-1-1 folder , add the folder "icons.tiff" (path is : ~/Pictures/openstepicons-1-1/icons.tiff). 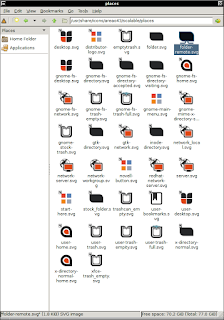 Same for the black term a root icons that I've placed in ~/Pictures/BlackNextIcons . 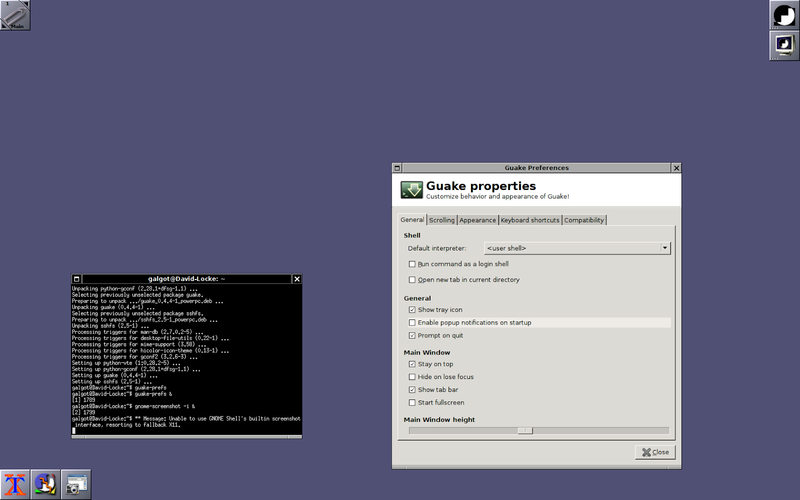 Now you can change the Guake icon , and the dock GNUstep icon. Btw, that icon is just plain horrible, really…Compare that to the Paul Rand NeXT icon, well it's the first thing I want to change on the WindowMaker desktop. So you can put there a NeXT icon if you want, there are several versions in the above pack. It's nice , but hey… this is not a NEXTSTEP system, so I usually put my own logo (yes I know, I put it everywhere , my psy is aware of that…). To do that , right-click the dock icon , go to "Settings" , and hit the "Browse" button in the Icon Image field, then browse to the icon you want to use. Which I found much better. It will then ask you for the server login and password to connect , with option as to remenber it or not. On Jessie I've found that if you select "remember for ever" option , a window pops up asking you to enter you user password to store the server password in the Keyring. With all that done you are able browse your network. You can also bookmark these servers and have them at hand in the left part of the Pcmanfm window. Ok, now lets tweak the WindowMaker preferences a bit. 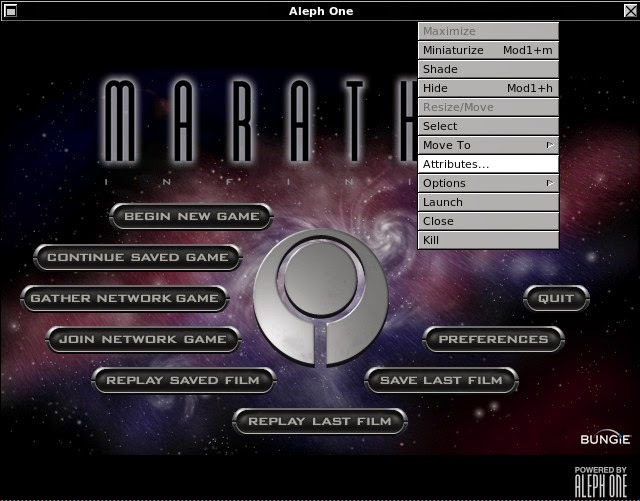 First the main applications menu. 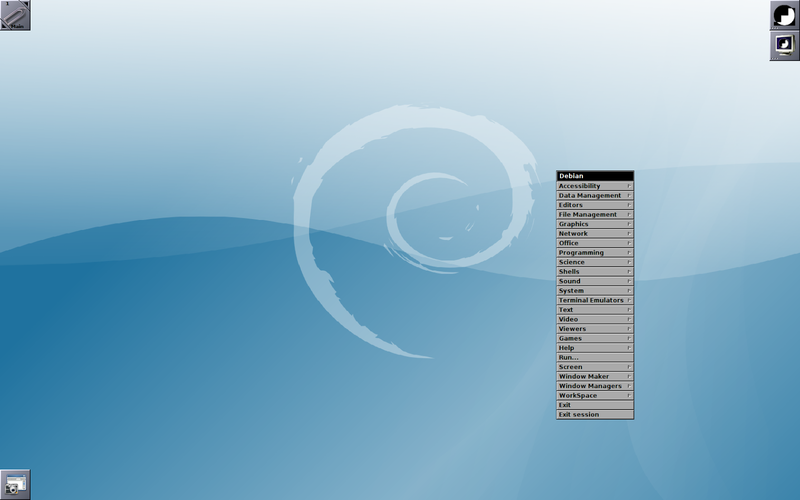 With Jessie, after WindowMaker install , I had the surprise to have a "Debian" menu , listing all the installed apps conveniently accessible through categories submenus . Well, why not, all nice and fine. But I'm more used to the default WM Applications menu, cause I usually access my apps by other means , like dock icons , wmbutton (more on that one later) or the drawer… And if you open the "Applications menu Definition" settings in the WM preferences , it will tell you something like that it's not a saved menu configuration, would you like to save it or not. If you decline as I did, you get back the default menu. 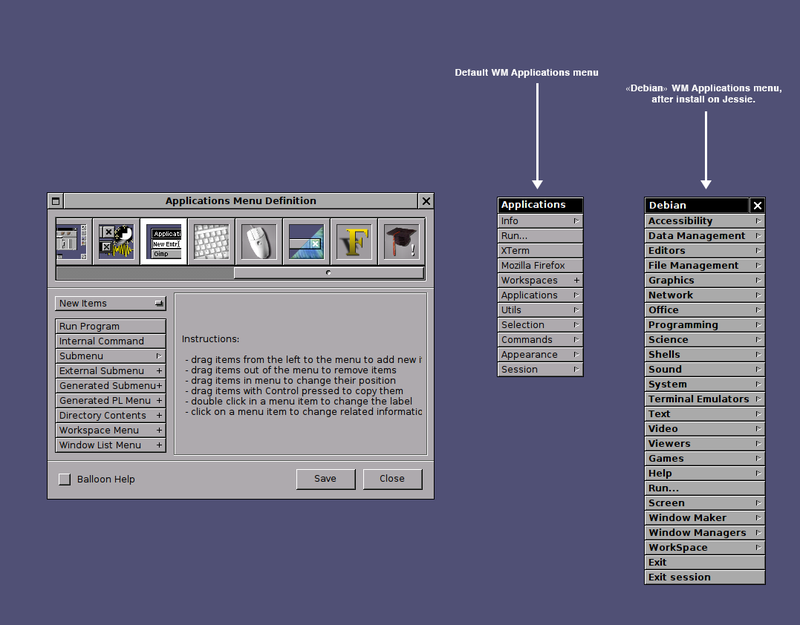 As WM theme , I use "Traditional" , to get a good NeXT/OPENSTEP look. Then , in "Other Configurations" , turn on animations, Smooth scaling. 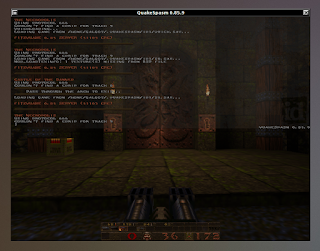 And choose the left most Titlebar Style, again to get a correct NeXT look. 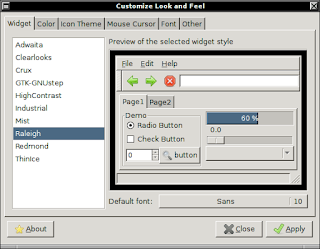 In "Font Configuration", I usually set the font size to 11 for Menu Text, Menu Title and Window Title. 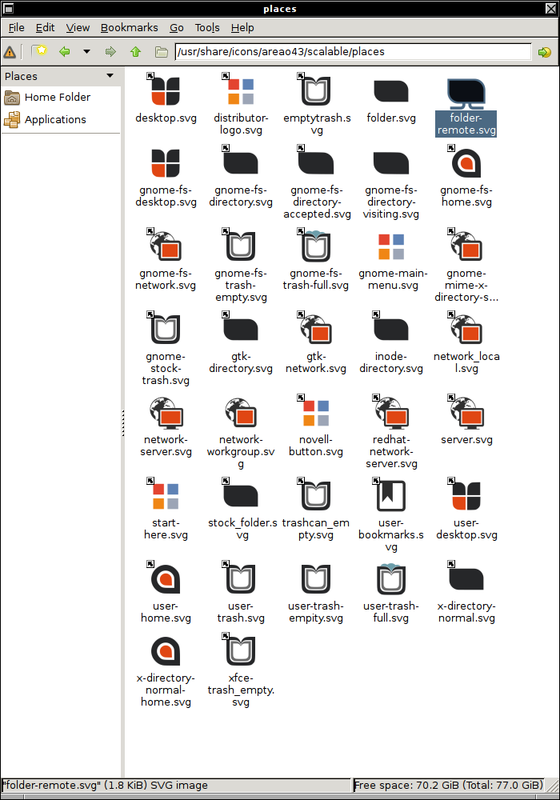 /usr/share/icons/areao43/scalable/places and rename it as "folder-remote.svg"
Note how the address is sftp://192.168.0.32. 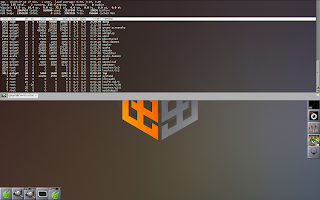 This is a strange thing happening in Jessie , even when I type ssh://192.168.0.32, it changes the address to sftp… Also note that I've already had bookmarked that same server as "Roy-Batty" on the side bar, and it still shows it as another mounted server "192.168.0.32" when I access it. So maybe a SSHFS problem here in Jessie … It works fine in Wheezy. Ok, end of part 1, next some dockapps. Anyway, it came and it's nice and working well. Indeed , with a 1680x1050 pixels screen. That was caused by a wrong screw model (too long) used in the battery compartment. I replaced it, and diminished the bump by very carefully hiting it . Almost invisible now. From that serial, it's a A1107 ! not a A1139. And after opening it , yes the main board is indeed a A1107 board matching that serial. But it as a A1139 hires screen. Funny thing is I've read somewhere that these screens models could indeed be swapped , but if a A1107 gets a A1139 screen it wouldn't go to sleep when lid closed, because the place of the magnet initiating the sleep in the screen lid is different for each models. But, on that one it works ! The PowerBook sleeps when I close it. So, maybe the person who reassembled that machine managed to move the magnet in the proper place… Anyway, it's well done (not like the misplaced screws…), cause screen bezel disassembly is very difficult on these models, and there is no sign of disassembling or damage on the bezel. Only other aesthetic problem with that machine is a missing (as usual) rubber foot, but I've replaced it, more on that latter.